Magnitude estimates for a given earthquake can vary between reporting agencies due to differences in methodology, data availability, and inherent uncertainties in seismic data. Individual agencies use magnitude estimation procedures designed to meet the agency's specific needs and monitoring capabilities. Even for well-recorded events, differences in magnitude of 0.2 or 0.3 units are common and representative of the inherent uncertainty of the magnitude estimation process. Obtaining an accurate measure of an earthquake's size is difficult. Earthquakes are complex processes that occur below the Earth’s surface away from direct observation and measurement. Determining a single number to represent an earthquake’s size has inherent uncertainties due to our assumptions about the material in which they occur and our inability to fully reconstruct the hidden process. Multiple methods are used to estimate magnitude. Fundamentally different calculation methods are specified by magnitude type. The USGS National Earthquake Information Center (NEIC) routinely calculates as many as a dozen different magnitude types. Multiple magnitude types are necessary because no single method is capable of accurately estimating the size of all earthquakes. Some magnitude types are calculated to provide a consistent comparison to past earthquakes, for which modern techniques cannot be applied. Attempts have been made to calibrate these magnitudes to the original Richter Scale, but since different techniques often measure different physical processes there can be large discrepancies between different magnitude types calculated for the same earthquake. These differences can be as large as 0.5 even in magnitude ranges where both techniques are considered valid. Some magnitudes types are fast to calculate and can be completely automated, while others require manual processing by a trained seismologist. Changes in the preferred USGS magnitude in the minutes and hours following significant earthquakes are often a result of a change in magnitude type as well as the inclusion of more data. This iterative procedure addresses the desire for rapid information and allows for timely improvement to derived USGS products such as ShakeMap and PAGER. Even for a given magnitude type, there can be differences in magnitude estimates from different agencies. These differences generally arise due to the use of different Earth models, data availability and data processing. The USGS National Earthquake Information Center reports on earthquakes worldwide. We strive for global consistency in the methods used for calculating earthquake parameters. This approach requires a systematic process as well as a more generic model of Earth's physical properties. A seismic network that is focused on a specific region will often tune their underlying models to their area of interest and monitoring history. To obtain the most consistent and meaningful information from magnitude estimates, researchers and policy makers should consider and specify both the magnitude type and source of that information. 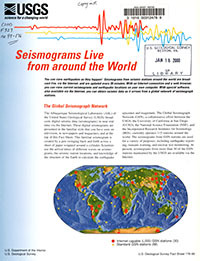 For example, local networks are generally the best source for consistent quality information in that region whereas global monitoring agencies such as the USGS National Earthquake Information Center can provide valuable information when comparing earthquakes across the globe. USGS map of the magnitude 6.9 earthquake off the coast of Japan on November 21, 2016. Cumulative number of earthquakes with a magnitude of 3.0 or larger in the central and eastern United States, 1973-2014. The rate of earthquakes began to increase starting around 2009 and accelerated in 2013-2014.